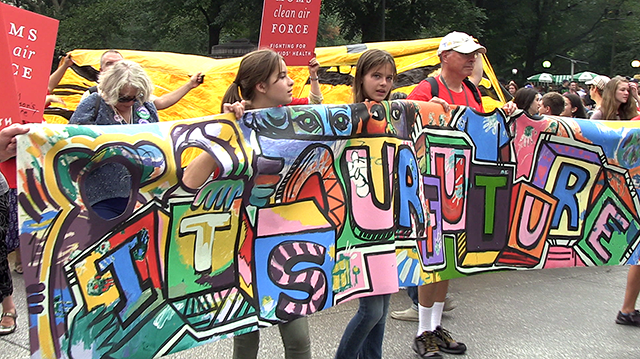 On Sunday, September 21st, the last full day of summer, we joined the People’s Climate March starting at Columbus Circle and stringing its way up Central Park West to 86th Street. Armed with a video camera, I captured nearly 400 motion and sound bites of marchers parading south. They came to the city from many walks of life and seemed to be joined together by a common link of common concern for the future of the earth. 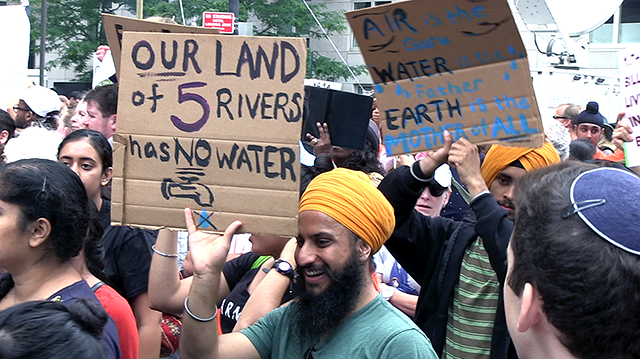 Indigenous peoples, community organizers, elders, sisters, rabbis, creationists, activists, earthwatchers, boisterous youth, and politicians rallied together and took to the pavement rounding left at Columbus Circle onto Central Park South, right down 6th Avenue to 42nd Street and then diverted west to 11th Avenue where the march dispersed. 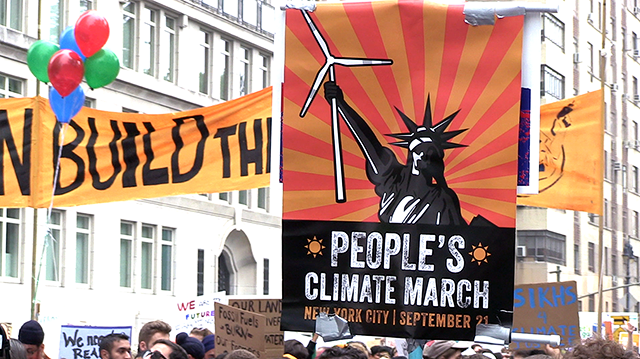 The requested route of the march was to terminate at the United Nations to bring a message alert to the Climate Summit 2014. But the route approved by the NYC police department re-routed the parade at Times Square 42nd Street toward the Hudson River. The mostly peaceful participants complied and no complaints were issued that I am aware of. 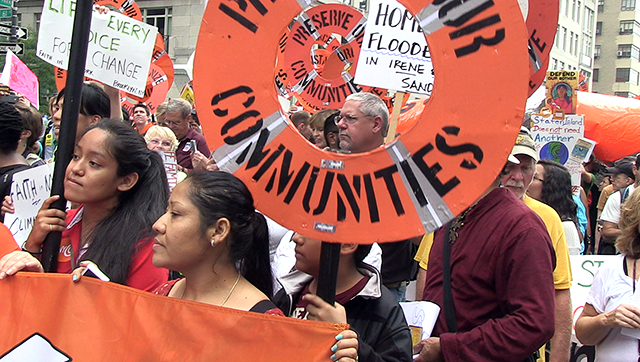 On the Saturday before, NPR reported that an expected 100,000 environmental activists would attend the rally. 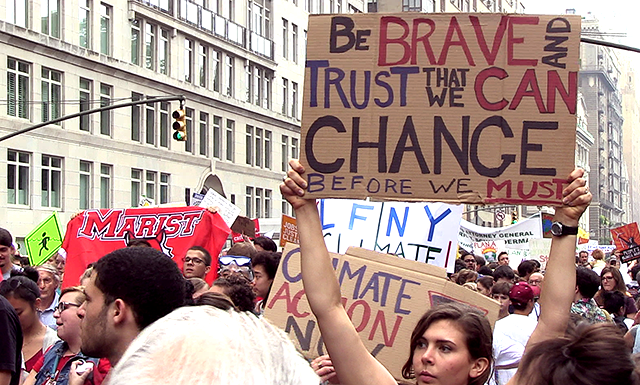 I paused to re-imagine myself now as an activist and not a concerned citizen of the planet. I was going to participate, out of curiosity to experience for myself who would attend, how it felt to be part of a march, how 150,000 “activists” would behave and what they would express in their chants, and on their banners carried in front of or on placards held overhead. I encountered a wide number of groups and slogans, and some individual opportunists selling solutions; but for the most part I was surprised to see many couples strolling arm in arm, families with children in strollers, on shoulders or scooters (I’m marching for Scooter Power, their sign read), teenagers and young adults: people of all age, ethnicity and religious persuasion. While impressed by the range of organized groups attending, I was most affected by the assembly of native peoples, dressed in full regalia, drumming and dancing in the front line. Their messages seem to harken back to the fundamental question of environmental justice, guaranteeing access to the rich resources of our continent. Stripped of their lands and sequestered on reservations, the resounding question remains: who is entitled to the riches of the earth, be it clean water and air, or the bounties of the land? The legacy of early colonization persists today, with the ownership of land and exploitation of resources for the profit of the people of privilege, passed down through lands deeded by the kings, inheritance and wealth expanded by capitalist enterprise. This seems to be the fundamental issue underlying the environmental movement – what is the proper balance with the earth’s resources and the people’s rate of consumption and waste. How can these resources be protected and accessible to all – for all of humanity, without compromising the biological wealth of the planet. The debate will continue in words and actions between government and policy makers, corporations and consumers and the territories in-between. Economic security and growth is driving the actions of government and corporations, tempered by the realization that we must re-examine our own lifestyles of over-consuming energy (in the form of transportation, shelters, food and consumer goods) while producing exorbitant profit, greenhouse emissions and waste. Ultimately, we must redefine prosperity, not quantitatively by Wall Street indicators, but by the quality of life, health and community. A moment occurred during the march that is impossible to capture on our cell phones or communicate via social media, but it was orchestrated via a text message sent simultaneously to thousands of registered participants: two minutes of silence at 12:58 following at 1:00 by a wave of cheers. At this appointed time, all participants in the march from Central Park West to 42nd Street raised their hands overhead in a memorable moment of motionless silence. Nearly a minute was lost in bringing the entire crowd to silence. During the remaining one minute, I felt a profound bond with the crowd in a kind of unprogrammed Quaker civic meeting. No words, no clamor, no marching. As the crowd settled into this sustained moment of silence, hands overhead, the sound of cheers gathered from the northern marchers sweeping down and around Central Park South, turning the corner and moving down 6th avenue reverberating between the wall of the buildings all the way to 42nd street. It was a largest public demonstration of solidarity I had ever experienced (including the cacophony of fireworks on the 4th of July), not interrupted or corrupted by words or explosions, but felt unanimously in silence. And then the march resumed. And so the march continues in memory, reported by and lost in the news media in an ongoing march of a myriad daily stories to feed readers and viewers and attract advertisers, while simultaneously recorded by thousands of images sent via personal mobile devices to millions of friends and families across the continent and oceans. In a “sea of events” happening day after day around the world and in our daily lives, one question remains in my mind: what impact can something like this have on policy makers, corporations and individuals to change legislation, business strategies and life ways? This question will be answered collectively and individually in actions, with many public and private debates along the way. The planet will, in turn, take different courses and, unlike the march, will not make it’s way toward Times Square, which exemplifies the follies of human greed and extravagance. Hopefully, it will find it’s way into the far reaches of the natural world (if there will be any remaining), where human clamor is replaced by the natural sounds of winds, animal cries and buzz, the motion of waves and rushing water – where regenerative ecosystems and sustainable agriculture are coupled with the redesign of human communities, all supporting and protecting a diversity of life and resources beneath an awesome galaxy of stars.